Usha Varanasi, Affiliate Professor of Chemistry and Director of the Northwest Fisheries Science Center, was recently presented the Seattle Aquarium Conservation Research Award. The award is presented by the Seattle Aquarium Society Board of Directors and a research grant is made to the Seattle Aquarium Research Center for Conservation and Husbandry (SEARCCH) in the name of the honoree. This year, the Seattle Aquarium Society chose to honor Dr. Varanasi for her efforts and achievements related to her work on ocean acidification and the study of toxins and chemicals and their effect on the marine environment. 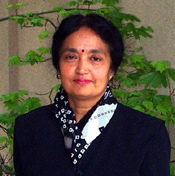 For more information about Dr. Varanasi and her work, please visit http://www.nwfsc.noaa.gov/usha.cfm.